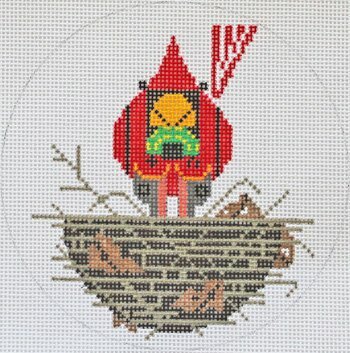 A Charley Harper needlepoint ornament called Cardinal Cradle featuring a cardinal feeding its chicks in the nest. The design is hand painted onto 18 mesh mono needlepoint canvas and measures 5" diameter. This Charley Harper needlepoint is sold canvas-only or as a kit. We use DMC cotton floss, Pepper Pot single stranded silk or Bella Lusso wool. If you wish to purchase stretcher bars we recommend two pair of 8" and some thumb tacks. This Charley Harper needlepoint canvas usually ships in one to two weeks. You can always check availability before you order.